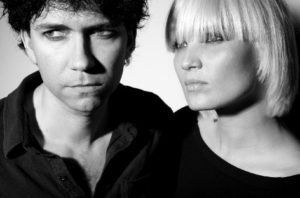 The Raveonettes might hail from Denmark but their core members currently call opposite coasts of the United States home. Still, one might not notice the distance, from the crisply aligned vocal harmonies Sune Rose Wagner and Sharin Foo conjure up in their music. Add to that singularly appropriate feeds of Wagner’s noisy guitar output and one arrives at the Raveonettes’ unique brand of retro but relevant pop. Equally inspired by the girl groups of the ’50s and ’60s as by legends such as Buddy Holly (“Rave On”), the Raveonettes make music that is simple yet embellished, accessible yet haunting. The Raveonettes released its Whip It On in 2002 in Europe, with the EP hitting streets in the summer of 2003 stateside. Originally intended as a dual package with the EP, Chain Gang Of Love followed a few months later. While the initial EP boasted its entire contents in B-flat minor, the large part of the debut full-length was done in B-flat major. Pretty In Black was released in 2005 and featured guest appearances by luminaries such as Ronnie Spector, Martin Rev, and Maureen Tucker. The record also marked the fulfillment of the band’s three-album commitment to Columbia Records. On to the new Lust Lust Lust, the group’s sensual third full-length, and Wagner explains that the tried-and-tested recording process was in play for this release as well: “I recorded Lust Lust Lust in my apartment in New York…exactly same approach as Whip It On,” he explains. LA-based Foo then came into the process to add her vocal and bass contributions. 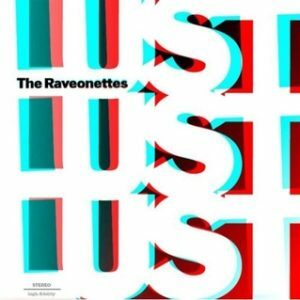 Lust Lust Lust, the Raveonettes’ first release on Vice, kicks off with synthetic beats as “Aly Walk With Me” takes us down a tranquil path before Wagner’s guitar tornado gathers strength at the two-minute mark. The calm and the storm then take turns, vying for the listener’s attention even as an outburst of distortion closes the opener. In fact for the most part, the album alternates between blissful, synchronized harmonies and blasts of fuzzy, reverb-heavy six-string mayhem, resulting in a sound that is both comforting and abrasive. “Hallucinations” peaks at the end with a guitar explosion, before “Lust” tiptoes in with the now trademark Raveonettes calm, layered vocals. The single “Dead Sound” leads into surf-guitar heaven and is accentuated by chiming bells during the chorus, while “You Want The Candy” is a catchy pop song that would fit on the radio in eras past, present, or future. The surf-guitar strains heard here, as in various other tracks, are merely another piece of the puzzle in the Raveonettes’ retro-futuristic scores. When quizzed on the album’s title — whether the lyricism, or the mood set by its sound, commanded the name, Wagner leans towards an all-encompassing “everything goes together” response. “Black Satin” and “Blush” prove that the duo’s melodious touch is still golden. If there is a con, the album does get a bit repetitive at times; there’s no dance number here like “Twilight” (off Pretty In Black), nor is there anything as forlorn as the lo-fi pessimism of “Love Can Destroy Everything” (off Chain Gang Of Love). The duo does slow things down with “Expelled From Love” and “With My Eyes Closed,” though, before “Sad Transmission” and “The Best Dies” close out the record, and proving that Wagner has not lost his knack for poignant lyricism. Beyond Austin, Wagner notes that the logistics of touring Europe and the US are largely the same, although he appreciates the fact that “healthier food” is available more readily in Europe as opposed to the easily accessible fast-food joints on this side of the pond. He DJ’s occasionally in NY currently and many Raveonettes gigs are followed by his stint at the turntable, although he adds that the latter is not as common a practice anymore. As our interview ends, an opportunity to pick Wagner’s brain regarding what he considers to the acts that primarily impacted the Raveonettes sound cannot be passed up. “Buddy Holly, Suicide, The Everly Brothers, Sonic Youth, The Cramps” all make the cut. And who would he like to tour or work with in the future? The Rolling Stones would make for a dream bill for the Raveonettes, he says, while personally, Wagner would love to collaborate with Dr. Dre! Such is Wagner’s versatile talent that neither of those aspirations should be laughed off.